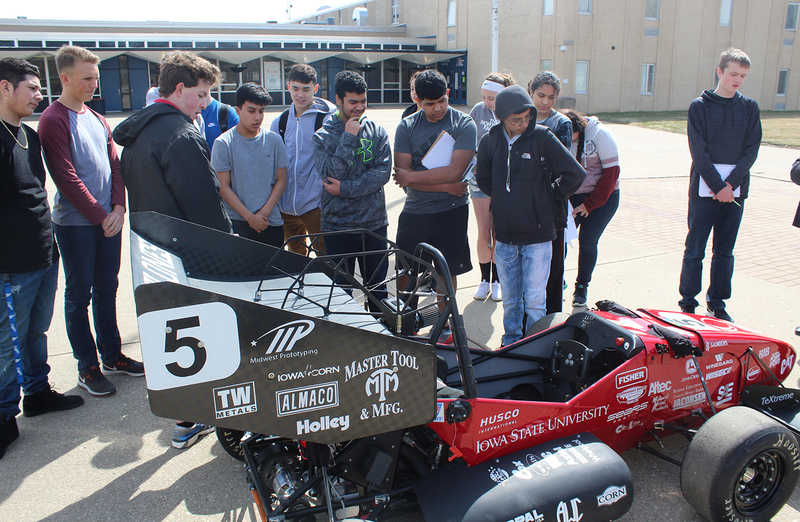 A College of Engineering student group is currently on a tour of Iowa high schools to teach teenagers about automotive engineering opportunities at Iowa State. 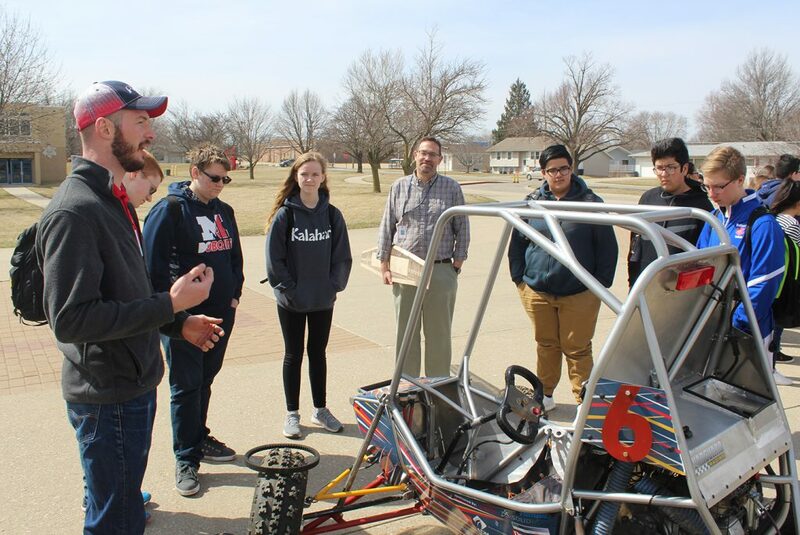 Iowa State’s chapter of the Society of Automotive Engineers (SAE) recently traveled to Marshalltown High School where they brought a few of their vehicles and told the students about opportunities available to them if they study engineering at Iowa State. SAE is one of the largest engineering student organizations on campus with more than 200 students spread across five competition teams: Aero, Baja, Clean Snowmobile, Formula and Supermileage. 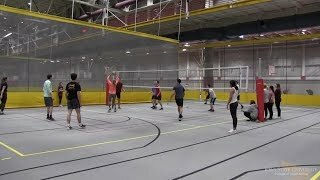 Aero builds a 12-foot wingspan RC airplane from the ground up to compete in a weight lifting and maneuverability competition. Baja designs and builds a single-seat, off-road racing vehicle which competes in more than five yearly competitions. Clean Snowmobile Challenge modifies a stock snowmobile to meet more stringent emissions and noise standards, while increasing performance. Formula designs a high-performance open-wheel race car, and is currently ranked 4th in the United States. Supermileage builds a high mileage vehicle from scratch, with a goal of reaching 800 mpg. SAE students are able to take material they learn in the classroom and apply it to their work on the various SAE vehicles and are also able to take the skills they develop through SAE and apply it to the classroom. Involvement in SAE also teaches the students about industry standards and best practices in the automotive field. 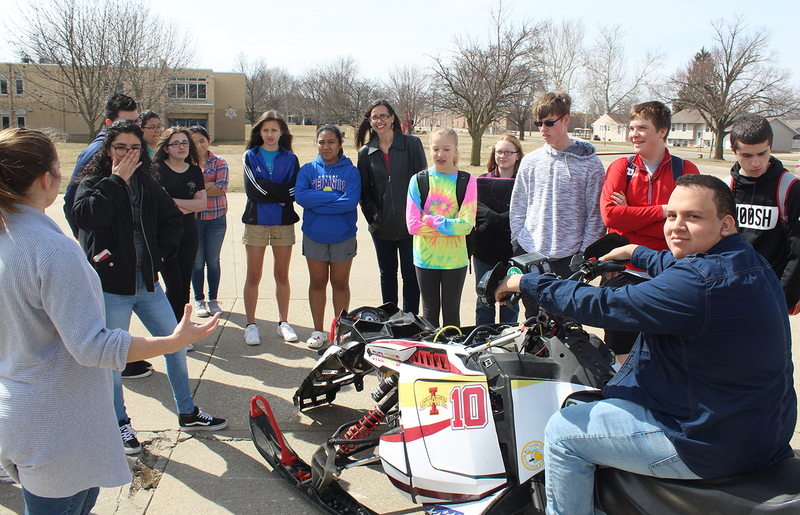 During their trip to Marshalltown on April 12, the team brought with them their Baja and Formula cars as well as their snowmobile. The team was invited by Mike Lazere, a PLTW and biology teacher at the high school. 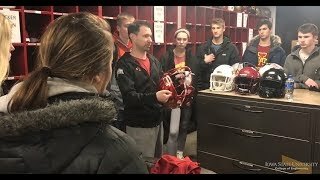 They talked to roughly three hundred students and staff members from PLTW classes, physical science, metals, business law, and sports marketing and entrepreneurship. 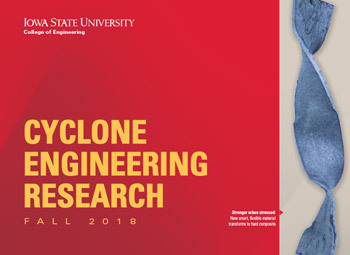 Jimmy Roslansky, Formula’s Aero lead and a sophomore in aerospace engineering, said outreach events like this are important for not only recruiting students to Iowa State and SAE but also for exposing pre-college students to the STEM and automotive fields more broadly. “Talking to kids at Marshalltown High School and other outreach events has allowed me to see how many kids are interested in STEM. While a lot are interested, most don’t really understand how STEM fields apply to the real world. Getting to see our vehicles gives them a visual representation of how their education will be used in the future,” Roslansky said, adding that he first got introduced to SAE by attending Iowa State’s ClubFest as a freshman. Next month the team will visit three more schools: Mount Vernon High School on May 9, Carlisle High School/Middle School on May 10, and Ankeny Centennial High School on May 11.